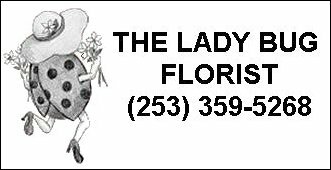 The Lady Bug Florist is a local Puyallup, WA florist with over 30 years experience in delivering courteous and professional service, along with the highest quality floral and gift items around. Owner and designer, Marilee Johnson invites you to order and our staff is ready to assist you with placing orders for local delivery or anywhere in the world. Not sure what to send? Let us offer some creative suggestions. Creating memories for a lifetime…at The Lady Bug Florist! Wedding & Special Event Flowers With The Lady Bug Florist designing the bouquets and arrangements, your wedding is sure to be a “blooming success!” Call us in advance at (253) 359-5268 and schedule a consultation with one of our talented floral experts. We also offer on-site decorating and corporate event planning as well. All Occasion Gifts ~ Browse our assortment of green and blooming plants for a gift that brings life to any room or office. We offer a nice selection of gift items, including fruit & gourmet baskets, balloon bouquets, silk floral designs, stuffed animals, scented candles, home décor, greeting cards, baby gifts, assorted candy and more! 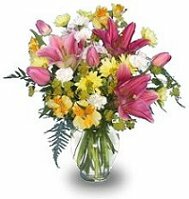 Thank you for visiting our website with flowers delivered fresh from your local Puyallup, WA florist and convenient online ordering 24 hours a day! !